Gemma O’Doherty at her unfair dismissal hearing against Independent News and Media at the Employment Appeals Tribunal in Dublin today, and with Garda whistleblower John Wilson during a break in the hearing. Irish Independent journalist Ms O’Doherty lost her job after she revealed that former Garda Commissioner Martin Callinan had penalty points quashed. 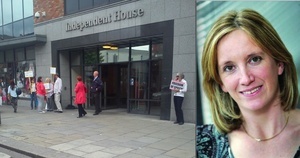 Independent News and Media apologised to the gardaí after former Irish Independent journalist Gemma O’Doherty visited the home of former Garda Commissioner Martin Callinan, an Employment Appeals Tribunal heard today. Ms O’Doherty, who worked with INM for 18 years until last August, claims she was unfairly dismissed by INM after she went to the home of Mr Callinan to confirm his address for a story she was writing about how he had penalty points quashed. She has also launched a defamation action against group editor-in-chief Stephen Rae and the Irish Independent, and is taking a case to the Personal Injuries Assessment Board. At the opening of her unfair dismissal case at the EAT today, Brian Kennedy, SC, for INM, argued that the tribunal be postponed until after Ms O’Doherty’s defamation case is concluded. Mr Rae was present at the tribunal today but is not party to the unfair dismissal proceedings. Mr Kennedy said because of the rise of the internet and the pressure on advertising, newspapers are going through ‘radical changes’ and ‘INM is no exception to that’. He also said because of INM’s significant bank borrowings, the company has had to undergo significant cost savings, which has included savings in its editorial operations through its restructuring from print to digital. Mr Kennedy said Ms O’Doherty was selected for redundancy on a non-voluntary basis. He said INM’s criteria for selection of non-voluntary redundancies centred not on seniority but on whether a position was essential for INM business and whether a role could be carried out by others or whether a role could be outsourced. Mr Kennedy said Ms O’Doherty was a features and travel writer and it was the view of INM that her travel writing could be “obtained from other sources” and therefore Ms O’Doherty fell within these criteria. The tribunal asked Mr Kennedy how many individuals were selected on a non-voluntary basis but he said he did not have a number to hand. 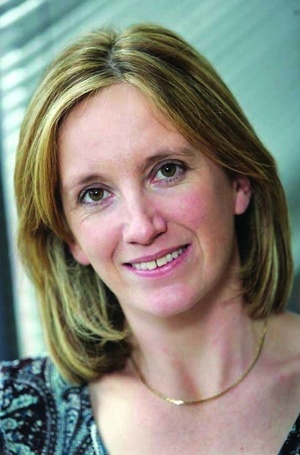 Mr Kennedy said that while Ms O’Doherty believes she saw her redundancy as “retribution” for her story on Mr Callinan, he said this is something “vigorously disputed” by his client. Mr Kennedy said, at 10pm on the night of April 11, 2013, she “decided to doorstep Mr Callinan”. He said Commissioner Callinan was away that night and his wife answered the door. He said she was “somewhat upset”, and subsequently, “INM newspapers apologised to the gardaí”. Ms O’Doherty’s story appeared in the Irish Independent a week later. Mr Kennedy said because of Ms O’Doherty’s defamation case there is a risk of overlap and a risk of double recovery being sought and, potentially, triple recovery being sought. He also said there was a risk of prejudicing a jury in the defamation case. Mr Kennedy said Ms O’Doherty was playing “a clever game” with her three actions and said there was “obvious potential for unfairness”. Cathy Maguire, BL, for Ms O’Doherty, argued that the unfair dismissal case should not be adjourned and that INM’s reasons for seeking an adjournment pending the defamation case were not substantial. 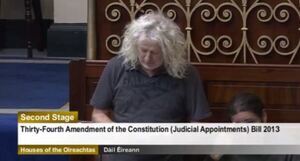 She said Ms O’Doherty’s case is a “common or garden unfair dismissal”. She said Ms O’Doherty is an award-winning journalist whose work has led to two public inquiries. Ms Maguire said Ms O’Doherty’s byline and photograph were removed from the travel section of the newspaper without her consultation and when she complained about this she was referred back to the penalty points story, concerning Mr Callinan, and the company immediately moved to make her redundant. She said Ms O’Doherty didn’t accept that she “doorstepped” Mr Callinan and that she was just checking his address for her story. Ms Maguire also said normal redundancy procedures were absent in the case of Ms O’Doherty. She said Ms O’Doherty wasn’t forewarned of the non-voluntary redundancy, nor was she offered redeployment or a pay cut. The unfair dismissal case was adjourned pending written submissions and on a decision on whether it should be postponed until after the defamation case is concluded. Posted in Misc and tagged Gemma O'Doherty at 6:00 pm on May 9, 2014 by Broadsheet.